To better understand the process of this lesson, read through all the stages before linking to the PowerPoint Presentation, web pages, or beginning your work. First stage is a group process, second stage is an independent process, and the third stage is a individual process where all the stages are combined into a class discussion. Working in your assigned group, you will explore the PowerPoint Presentation on the History of Robotics and answer the questions found at the first link. 3. View Slides 15-41 on "Our Times." Answer questions 8-15. 4. View the following three videos. Now let's learn more about how robots are classified. 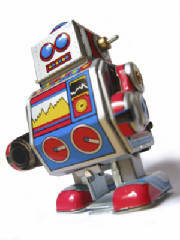 Go to the Buzzle.com website and read about the different types of robots. Print the worksheet and answer the questions. On notebook paper, write a short review of each website and what you liked or disliked about the games. Write a one page, doubled spaced paper on what you have learned in this webquest. Be prepared to present your findings to the class during our discussion.